The Alchemical Hydra is a new Hydra Boss found within the Karuulm Slayer Dungeon on the Great Kourend. The Alchemical Hydra can only be fought while on a Slayer task for Hydras or a boss task for Alchemical Hydras and has a slayer level requirement of 95. The Alchemical Hydra is currently extremely popular, as it has only just been released the price of the unique drops has not yet settled. The Hydra Leather, Hydra Tail, and the Hydra Claw can all be crafted into the Ferocious Gloves, the Bonecrusher Necklace and the Dragon Hunter Lance respectively. The Hydra also has three non-tradeable unique drops, the Hydra’s Eye, Hydra’s Fang, and the Hydra’s Heart. These three items are combined to make the Brimstone Ring, the new best in slot tribrid ring. The most effective tactic to use at the Alchemical Hydra seems to be to use Ranged, with either a Toxic Blowpipe or a Twisted Bow. The Alchemical Hydra has three phases and can deal damage of both Ranged and Magic. The Ranged attack looks like fanged projectiles, while the Magic attack looks like two small green projectiles. The Hydra will use three of the same attacks in a row, before switching to its other attack style – exactly like Demonic Gorillas. For this reason, when you correctly predict the Attack Styles, you can pray against them to take 0 damage. Phase 1 – When you first enter the room, the Hydra will have a green carapace, and should be lured to the red vent within the room. During this phase, you should be on the lookout for poison pools, and avoid them accordingly. Once the Hydra reaches 75% health, it will progress to phase 2. Phase 2 – During Phase 2, the Hydra will now have a blue carapace and should be lured to the green vent within the room. During this phase, the Hydra will launch electrical projectiles which will all move towards your current location, and should be avoided. Once the Hydra reaches 50% health, it will progress to phase 3. Phase 3 – During Phase 3, the Hydra will now have a red carapace and should be lured to the blue vent within the room. During this phase, the hydra will launch two fire walls around the prayer, and launch a separate fire attack which will track the player’s movement and should be avoided. Once the Hydra reaches 25% health, it will progress to phase 4. Phase 4 – During Phase 4, the Hydra will now have a gray carapace and you do not need to lure it to a vent. 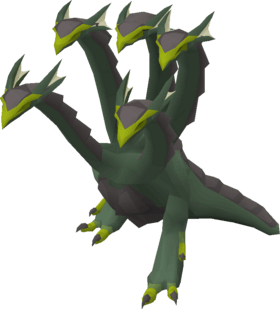 During this phase, the Hydra will continuously change attacks, one after the other, in a similar manner to the ‘Jad’ phase a Zulrah. Simply switch protection prayers, between Protect from Magic and Protect from Missiles between each attack to nullify any damage from this phase, and finish the kill.